I did it! I Gadgeated! 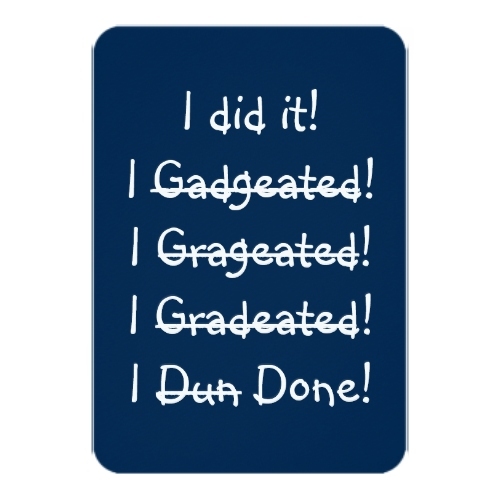 I Grageated! I Gradeated! I Dun Done! A funny, humorous, hilarious, customizable graduation party invitation, featuring misspellings galore by a harried elated graduate. Great, fun, personalized graduate party announcement card for grads of all ages. Personalize the card with the graduate's name, party venue - day - date & time details at the back. You may choose from 12 different paper types for your invite. Each card comes with its own standard white envelope. Fun invite for boys and girls graduating from kindergarten, middle or high school, college, and university.